Huawei may not be a full member just yet but it's keener than most to follow the club's dress code. Elaborate exteriors are the thing that defines the brand and that's not limited to the premium line of devices. If it is refined design and elegance you are after, Huawei's phones are consistently on the shortlist. Naturally, using premium materials and adhering to high build standards results in a premium price tag. As the mobile scene is quickly changing, midrange devices are getting more powerful and feature-rich with every generation. Huawei is genuinely trying to match this on the outside. The P-series and the G-series are now really capable of rivalling their Mate siblings. The Huawei G8 is a perfect example. It's been following the premium Mate S all the way from the rumor mill to the production line and currently offers the same excellent design and some of the new and exciting features of its bigger sibling, all wrapped in a package that hopefully won't break the bank. Even though the Huawei G8's more or less conceived as a more affordable alternative of the Mate S, the handset doesn't really come off as a blatant compromise. Unlike many "lite" versions out there, the G8 has a distinct feel of its own. It is somewhat less delicate than the Mate S, but the real distinction in the general feel and handling comes from the rounded body design more than anything else. 13MP 4160 x 3120 pixels autofocus camera with OIS, dual-tone LED flash, 1080p video recording. Just like the Mate S, the G8 offers a spacious 5.5-inch FullHD display with a 2.5D curved edges, with a little bit more side bezel. With 90% metal, the exterior is pretty much the same. And the similarities in this particular pair are not just skin-deep. In fact, interestingly enough, they are quite comparable in terms of hardware and features. 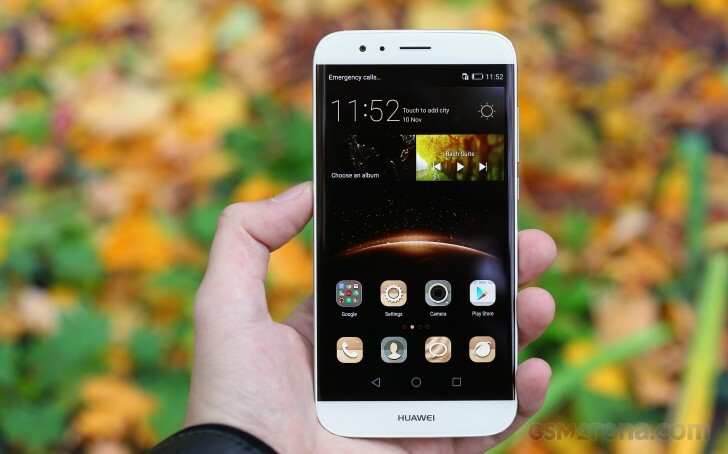 The Huawei G8 is based on a Snapdragon 615 chip, which is undoubtedly a more standard choice than the custom home-brewed HiSilicon Kirin 935 that powers the Mate S.
Now, you must be thinking the G8 and its hardware can't possibly be that similar to the considerably more-expensive Mate S. So, have any corners been cut? The camera setup looks nearly identical on paper with a 13MP main unit, complete with autofocus and a dual tone LED flash. What the G8 is missing is the RGBW array for improved light-gathering capability and it has a 5MP front-facer compared to the Mate's 8MP selfie cam. Yet, a closer look at the spec sheet actually reveals some more pleasant surprises. The all new and improved fingerprint reader from the Mate S adorns the back of the G8 as well. High precision, speed and touch gestures - yes, that's the one. Last, but certainly not least, the extra depth of the G8 has allowed for a 3000mAh battery pack, a good 300mAh more than the Mate's. Things are looking good so far, but let's not rush to judgment yet. Follow along for a closer look at the Huawei G8 from every angle and some proper benchmarking. behind camera lens always got problem.... got stock to repair? very problem face for g8 , 4th time mobile display change if not change display per day 30/40 time restart mobile so very disgusting for g8 , original display not market so it is very loss for me with pain full time pass 4 me, .